In 1997 I was working my first "real" job, you know, one that requires a shirt and tie. Working full-time days and taking 3 classes a semester at night, this was towards the end of my decade and a half hiatus from The Hobby. As a result, I missed some highly innovative products and design concepts including the advent of the memorabilia and autograph card craze. Subsequently, I also missed out on what, today, is one of my favorite football products of all-time. 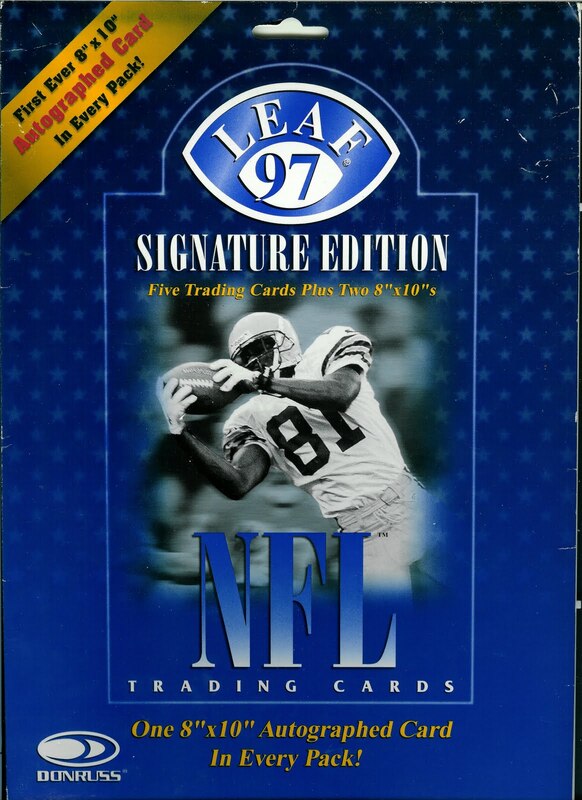 1997 Leaf Signature Edition Football. The product's checklist included some of the biggest names of the era including; Steve Young, Warren Moon, John Elway, Jim Kelly, Eddie George and Jerome Bettis. In addition to the current players, Signature Edition contained 11 retired players with exceptionally notable names as Sammy Baugh, Dan Fouts, Y.A. Tittle, and Kenny Stabler. My mom, who I have mentioned before here on the blog, is an avid garage saler and unlike some people's mothers who threw their collections away, mine keeps an eye out for items of interest for me and is savvy enough at this point to shy away from anything between 1985-1995. My Mom scored this at a garage sale for a buck. 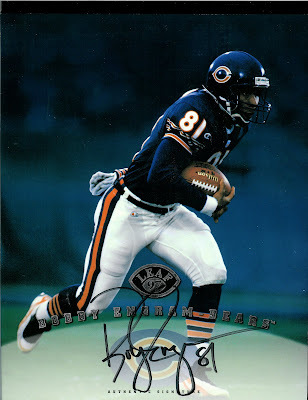 So what did I pull . . . .
. . one of my favorite Bears receivers of all time, Bobby Engram. Score!! She also found this sweet color 8"x10" photograph of Scottie Pippen and Michael Jordan at their, near annual, championship rally in Grant Park Chicago. 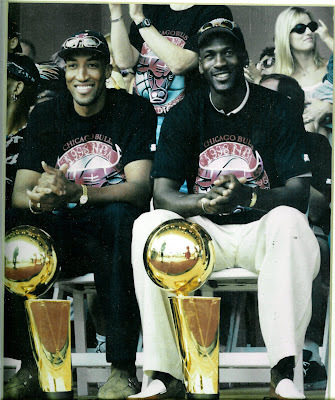 This is from the Bulls' 6th and final championship of the Jordan era. I was at the rally that year and fans were already beginning to feel like this would be their last hurrah. The photo is framed and matted and while not autographed is still a great photo. Another $1 score. Thanks Mom! !